Traditional barbecues come in all shapes and sizes from a variety of home improvement outlets, but if you are serious about barbequing and enjoy your DIY, what could be more satisfying than building your own brick barbecue from Acheson & Glover brick? 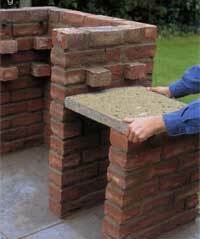 The materials that make up this brick barbecue are relatively inexpensive, and as well as making a unique feature this will blend in beautifully with your home and patio and will last for years to come. The site chosen for this barbeque was a paved area, to the side of the main patio. The garden was large so the barbecue didn't suddenly become the dominant feature. Wherever you decide to build your barbecue, it must be on a solid hardstand (paving is an ideal surface for this project). Make a wooden frame to act as a template guide to the dimensions of the grill kit. 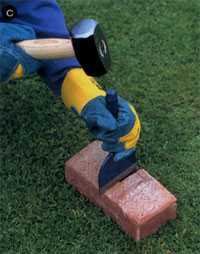 Lay the bricks out dry (without mortar) to enable the correct brickwork bond to be determined. All of the Acheson & Glover brick range is suitable for this project, Acheson & Glover brick and paving centre staff can recommend contrasting colours which will blend in well with your existing home / patio area. Bed the bricks on a bed of mortar made up of five parts soft building sand to one part cement, with plasticiser added to keep the mix supple. Use a spirit level to ensure the brickwork is level and plumb. Here, a TerraPave paving flag (400x400mm) is being used to act as a tabletop. Lay the flag down as a guide to the independent leg position. 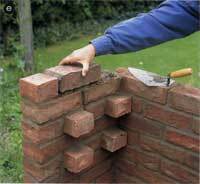 To get the brickwork bond correct it is necessary to cut half bricks. Cut these on a soft surface with a bolster chisel and club hammer. Wear protective clothing for this operation. When you have the brickwork to the correct height for the slab table, turn some of the bricks, so they act as corbels (supports) for the table and the grate. Ensure that you measure the width of the grate accurately before finally placing and securing the corbels so that you will be sure of a good fit once the grate is in place in the finished barbeque. Repeat the corbels two courses up to support the cooking griddle. Again, measure the position of these carefully to ensure that there are no unpleasant surprises once the barbecue is complete. Two more courses of bricks are required to complete the barbecue. 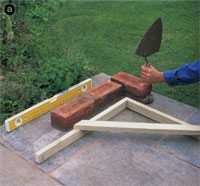 Push four metal pins into the mortar below the top course of brickwork to support the warming griddle shelf. You might want to fit a decorative flat coping or double cant special brick to finish off. Not only will this look superb, it will also usefully serve as a rest for drinks during cooking. 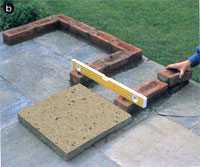 Set the paving flag on a bed of mortar to make a table top alongside the main body of the barbecue. Leave the brickwork to cure for a couple of hours. Then, using a jointer (a bent copper pipe or garden hose will suffice), rake out the top crust of the mortar, to make a tidy job. 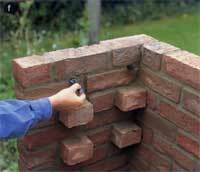 Finally take a soft brush and carefully brush over the brickwork to complete the job ensuring you do not disturb the mortar.